Be sure to check out the Georgia Force on MeTV Saturday night at 7:00 p.m. The Force welcome the New Orleans VooDoo to the Arena at Gwinnett Center. The Force sit in first place in the American Conference’s South Division. New Orleans is fourth in the division. MeTV can be found on Comcast Channel 248 an Charter Channel 126. The Force come into the game after losing a tough contest to the Kansas City Command last week 39-27. The offense for the Force struggled to get anything going, but a big reason for their offensive woes was the fact they were playing without starting quarterback R.J. Archer and No. 1 receiver Larry Shipp. Archer missed the game due to his wedding and Shipp was out due to an injury. Both players will be back in action on Saturday. Archer, who was invited to the Detroit Lions minicamp last month, has steadily improved his game and should provide much needed consistency on offense. Archer has completed 61 percent of his passes, thrown for 1,667 yards, 39 touchdowns and five interceptions in eight games. Shipp has been the go-to-guy for Archer, as well as, backup quarterback Kevin Eakin this season. Shipp leads the team in receptions (86), yards (1,013) and touchdowns (21). C.J. Johnson and Jake Allen will see a lot of action this week as well with Archer back in the lineup. The defense for the Force has been solid, but they are missing Tracy Belton, who is out with an injury. He will miss the next three games. The defense has only surrendered 49.5 points per game which is second in the league , behind only the Cleveland Gladiators. But because the offense is only averaging 45.8 points per contest, the Force are only one game above .500. In fact, they are one of three teams in the league that is not averaging 50 points per game. New Orleans comes into the game with a 4-6 record, and they are coming off a loss to the Arizona Rattlers, who have the best record in the league. They do have one of the better quarterbacks in the league in Kurt Rocco, who has thrown for 3,009 yards, 61 touchdowns and nine interceptions in 10 games. He has three very reliable receivers to throw to in L.J. Castile, Quorey Payne and Josh Bush. All three receivers have at least 700 yards and 15 touchdowns. The VooDoo defense has surrendered 13 points per game more than the Force, but they know how to create turnovers. 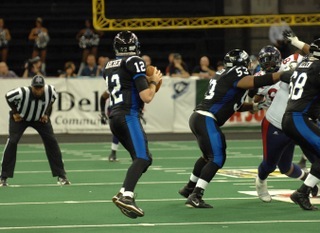 The VooDoo have picked off 21 passes so far this season and Jeremy Kellem leads the team with seven. Kellem also leads the team in tackles (55) and is second in the league in passes defended per game (2.10). What this game comes down to is offensive play. If the offensive line can protect Archer, the Force should be able to score a lot of points against a defense that surrenders 58 points per game. On the flip side, the defensive line for the Force has to find a way to pressure Rocco and the secondary has to pick up the slack that Belton left. With seven games left, it’s important for the Force not to have any more slipups. If they want to separate themselves from the Tampa Bay Storm and the rest of the American Conference South Division, the Force have to go on a run starting now.